I never got my Halloween decorations out this year. Too much going on, and no inclination I guess. I've been really busy getting furniture pieces done, and this is the first of 3. I'm getting better at not leaving pieces behind, and then having to go back and hope that no one else was more decisive than me! This one was a retrieval though. I've been so focused on getting holiday items, that this one was more of an after thought. 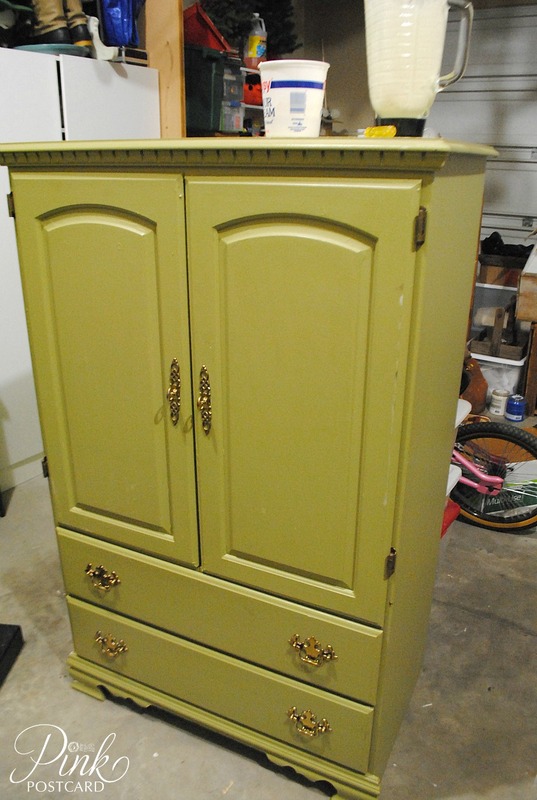 This cabinet was in great shape. It's not vintage, but so useful, and it had potential. 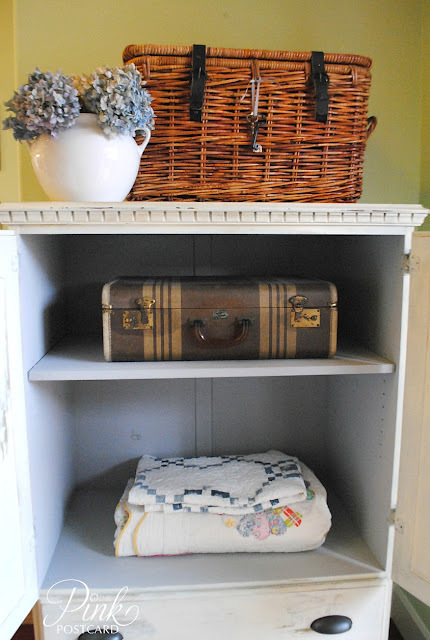 The green paint needed a refresh, so I painted it in Miss Mustard Seed's milk paint, Linen. It's a nice creamy white. One thing I really like about the milk paint is that like ASCP, you can paint over a surface like this without priming or sanding first. In fact, the dirtier and less prep you do, the better results for a chippy finish. I also decided to try out the crackle medium that is part of her line of paint, and I learned a lot about it with this project! The crackle medium comes in a fine powder form and you mix equal parts water with it. Once it is stirred, you let it sit for about 20 minutes to absorb all the water, and then re-stir to remove lumps. I use an old mini whisk, and it works great. Then, you paint on the crackle medium before the final coat of paint. With this first time use, I brushed it on using a sponge applicator. I let it sit until it turned tacky (about 15 minutes) and then painted on the final coat of Linen. I wasn't seeing a whole lot of crackling going on an hour or so later, and was disappointed. 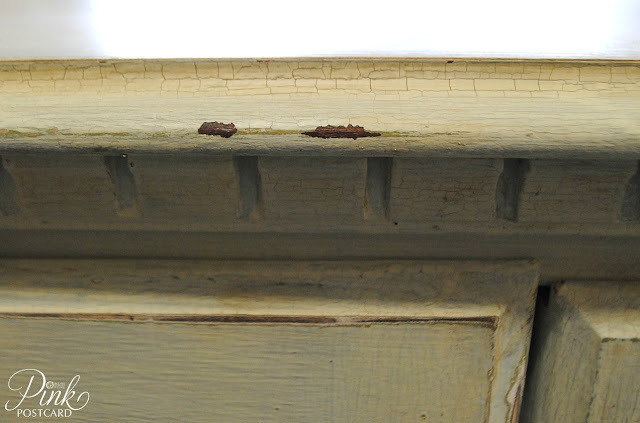 I started the distressing process (on the furniture, not emotionally) ;) using a scraper. It seemed that the crackle medium wasn't quite set up yet with the paint! It was scraping off gooey. I looked over some of the other spots and realized that where the application was a little thinner (less medium) it was crackling. Bummer. Just scraped off a bunch of it! Lesson learned, let it set up, and don't rush it. But, the results where it took to the surface, and I didn't scrape it off, are fantastic! Once it was waxed, I took some dark wax and went over the crackled spots to accentuate it even more. The interior got a coat of Paris Gray. New knobs and pulls for the exterior. 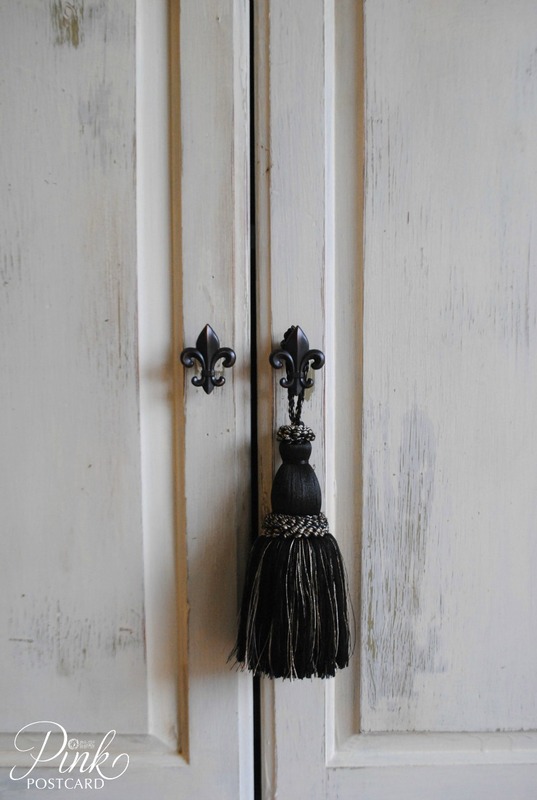 Love the fleur de lis knobs I found at Lowe's. It will be a great piece for showcasing holiday stuff in my space. 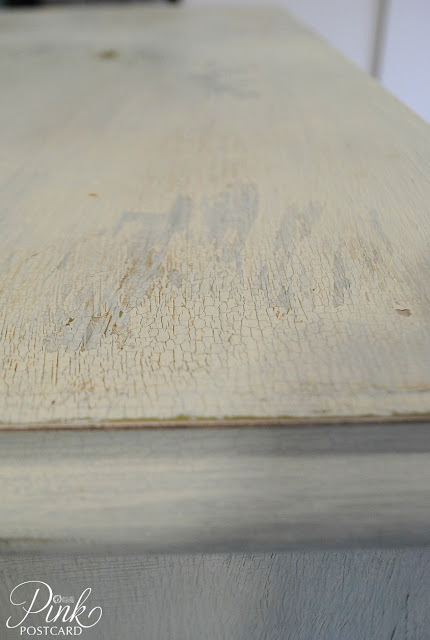 Have you tried the crackle medium yet? 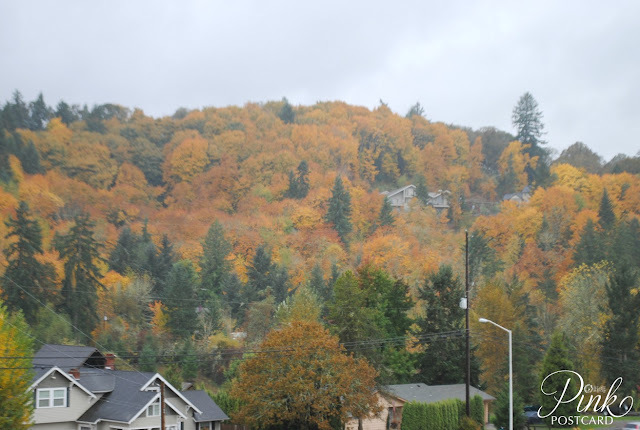 It's a bit wet here today, but the fall leaves are gorgeous. I am so thankful for every season we get to enjoy in our home. The hillsides are beautiful, no matter what time of year it is. Wishing you a beautiful, safe, and fun Halloween! Have not tried her paint yet. Thinking about using it for one of my beds in the guest bedrooms. Your piece turned out looking great. I didn't have good luck with the piece that I painted with MMS paint:( I still have some left and will try it again. It's absolutely lovely, Denise! Love the knobs too. I love that the crackle is small, it looks more authentic. What a great job. Love it. the crackle is perfect on that piece! and i LOVE those pretty leaves! What a nice transformation, beautiful job!! Love your cabinet. I haven't tried MMS paint or her crackle but I have used a different crackle paint and I love the look. I love this - I am going to order that crackle medium. It's way different than the crackles of today! LOVE! Denise that piece turned out fabulous!! I just ordered MMS milk paint and can't wait to get started on a piece! It looks wonderful. 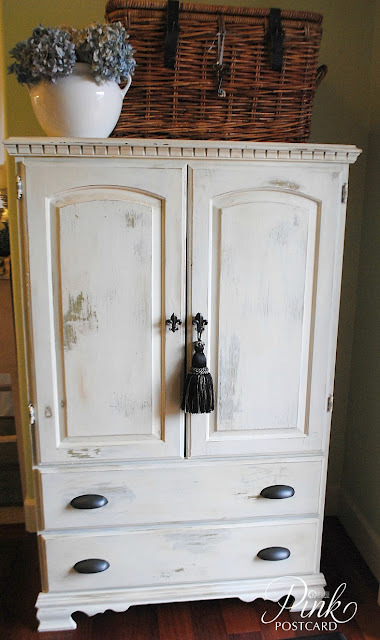 I have to admit I'm a little scared of milk paint, but I love seeing what everyone else comes up with. Great cabinet! I love it Denise! 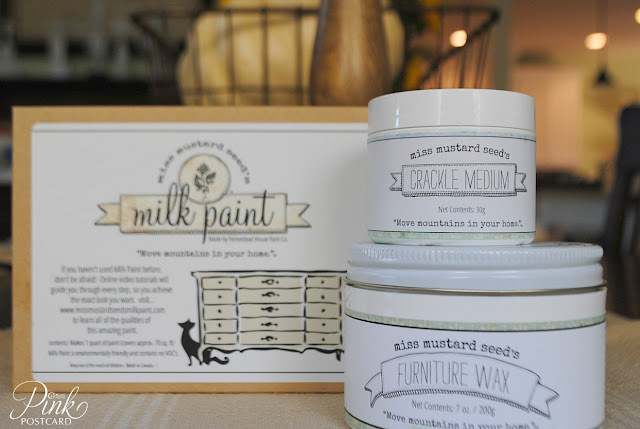 Thanks for sharing the Miss Mustard seed products and your tips. I have been curious about them. Miss you! Beauiful, I love the way it turned out.